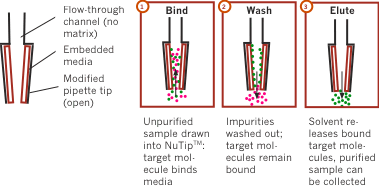 Protein/Peptide Enrichment NuTip is based on Glygen’s flagship NuTip micro-SPE technology, enabling separation of low-concentration/volume samples by maximizing surface area in contact with the sample. Enrichment media is embedded directly in the inner surface of the tip: there are no polymers, glues or matrices. This proprietary design prevents contamination or permeability problems common in competitor tips. C18: A Cvetkovic, et al. Microbial metalloproteomes are largely uncharacterized. Nature 466 (2010), p. 779-782. C18: N Ahsan, et al. Ozone stress-induced proteomic changes in leaf total soluble and chloroplast proteins of soybean reveal that carbon allocation is involved in adaptation in the early developmental stage. PROTEOMICS, Vol. 10, Issue 14 (2010) p. 2605–2619. Click the button below to add the Protein/Peptide Enrichment NuTip to your wish list.